Cheri Florance, the author of Maverick Mind (G.P. Putnam’s Sons, $23.95), will lead a workshop March 26-28 at Ohio State University. Visit www.cheriflorance.com for more details. 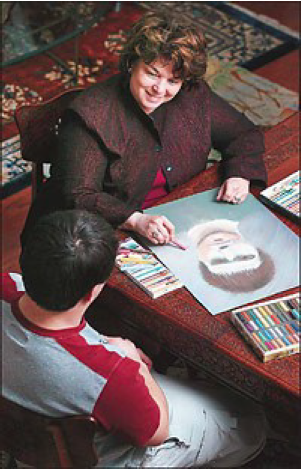 Florance sketches a portrait of her son Whitney, the subject of her book. Her commitment to helping her son overcome his profound problems eventually led to ground-breaking research that could help countless others. With co-writer Marin Gazzaniga, Florance recounts her ordeal — and Whitney’s triumph — in Maverick Mind: A Mother’s Story of Solving the Mystery of Her Unreachable, Unteachable Silent Son. The book takes readers on a journey through central Ohio schools, where she steadfastly refused to have Whitney assigned to special-education classes. The schools ‘‘evaluated him as a very low-functioning child and in a way he was,” Florance said. ‘‘But I wouldn’t accept their recommendations at face value. A single mother of three, Florance endured accusations of bad parenting. A friend pleaded with Florance to give up on ‘‘the wild child” for the sake of his older sister and brother. Florance feared that her dream of a normal life for her son was nothing more than the fantasy of a mother in denial. The reward for her persistence and probing is a young man finishing his senior year at Bishop Watterson High School and shopping for colleges. The turnaround is startling, even to Whitney, who barely recognizes himself in his early, most difficult years. and director Jim Silcott watch a rehearsal of the production of 42nd Street at Bishop Watterson High School on the North Side. Whitney Conway, who did not speak until he was 6, sings and dances in the musical. Shortly after Whitney’s birth, specialists said he was deaf, mute and severely retarded. In her book, Florance describes an unresponsive baby as ‘‘dead weight” and a ‘‘sack of potatoes.” Whitney failed to indicate desires or needs. As a toddler, he began exhibiting behaviors commonly associated with autism. He was prone to several fits a day, during which he flailed, kicked, scratched and banged his head on the floor. Little Whitney frequently tried to bite people and urinate on them. He unrolled toilet paper and emptied the contents of the refrigerator on the kitchen floor. 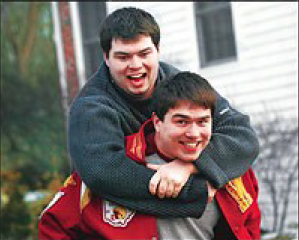 William Conway, top, grapples with his younger brother, Whitney, in the back yard of their Worthington home. William, 19, helped their mother help Whitney, 18, overcome profound problems. Dr. Florance found him at age 3 pressing a knife against an arm of his older brother, William. His mother sensed that his anti-social behaviors were attempts to communicate, not malicious acts. She also observed signs of intelligence. Whitney learned to use the toilet without potty training. He disassembled toys, pens and cameras, expressing a fascination for their inner workings. He also demonstrated an uncanny knack for finding his way to places he had visited only once. In his silence, his mother concluded, Whitney was a visual learner who appeared to be thinking without words. Drawing on her professional experience in the diagnosis and treatment of communication disorders, Florance embarked on a strategy that exploited Whitney’s visual strengths to develop his speech and language. 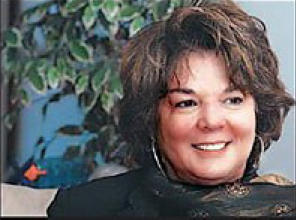 Despite her son’s struggles, Cheri Florance would not give up on Whitney. She recruited his brother and his sister, Vanessa, as assistants. They mimicked with toys Whitney’s daily routines to build his sequential thinking and demonstrate human interaction. They labeled all the items in their house and taught him words through logos and pictures instead of phonetics and oral repetition. 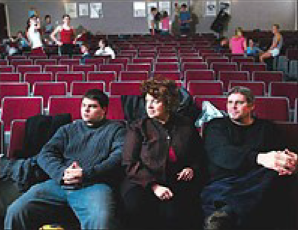 In their ‘‘therapeutic Disneyland” at home, the family adopted music, theater and dance as teaching tools. ‘‘We used the arts to try to make Whitney better,” Florance recalled. ‘‘The kids liked that more than sitting down with Whitney and trying to make him write the letter A.” Family members changed the way they spoke to Whitney, practicing supportive language that invited him to talk. Some educators marveled at the sacrifices Florance made on behalf of her son. ‘‘She tailored her life to make Whitney her highest priority,” said Sally Lindsay, director of Clintonville Academy, where Whitney attended seventh and eighth grades. Florance moved and changed jobs to enroll her son in the best schools and allow her to participate in his classroom instruction. ‘‘She entered Whitney’s world,” said Dr. John Stang, a dean in the Ohio State University College of Medicine. Stang encouraged Florance to write her book, which was released last week. Through Whitney’s elementary-school years in the Dublin district, Florance fought skeptics and embraced advocates. Some administrators and staff members at Riverside Elementary School thought Florance was foolish for rejecting special-education services for her first-grader. ‘‘Segregating people with disabilities has never proved to work out too well,” she said. ‘‘If we assimilate kids, everyone benefits.” When Whitney was in the second grade at Riverside, school psychologists filed complaints about his meddlesome mother to three practice boards. The boards eventually cleared Florance, and the district apologized. One of the heroes in her book is Philip Niemie, a former Riverside principal who risked his job to counter recommendations and mainstream Whitney. 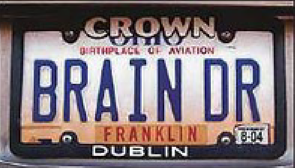 ‘‘Cheri had a professional reputation that was off-center, and I have always been unconventional myself,” said Niemie, a self-described ‘‘surfer dude from California.” Now the principal at Bailey Elementary School in Dublin, Niemie practiced what he preached: parental involvement. Other heroes in the book include classroom teachers eager to work with Whitney despite the extra attention he required. Florance volunteered as room mother. Florance counted a final breakthrough in her son’s development when he aced his 10th-grade biology test at Bishop Watterson. Through her son, Florance thinks she has discovered a communication disorder syndrome. She has appeared with Whitney at the National Institutes of Health and at the Pasteur Institute in France to discuss her findings, which are the subject of a research project at Ohio State University, where Florance is an adjunct professor of psychiatry. Whitney’s influence on science matches that of the people he touched. He is especially close to his brother and sister, who attend Manhattan College. Whitney may join them there next year. The siblings shared their mother’s hopefulness and dedication. Pistone, Whitney’s caregiver during his preschool years, married and left Columbus when Whitney entered elementary school. She has thought of him often over the years. Whitney acknowledges the possibility that he was born for a purpose.